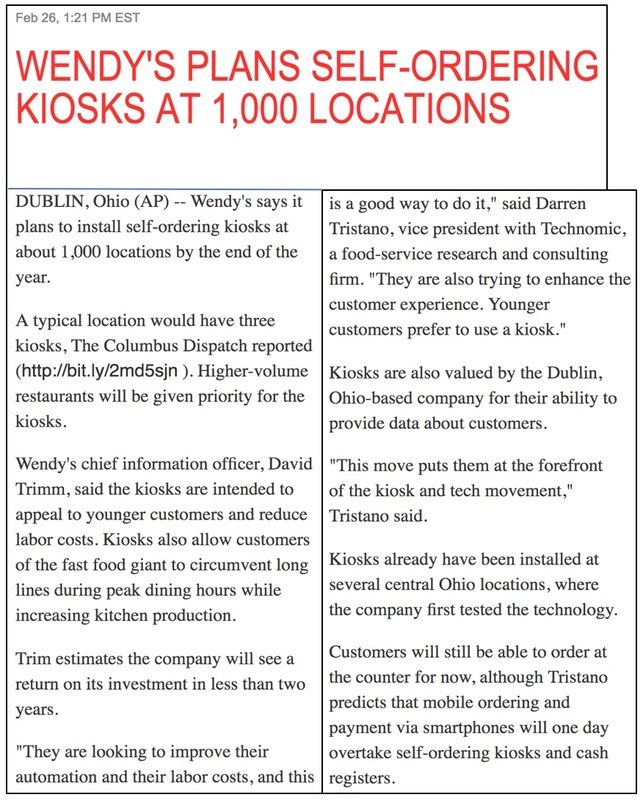 A week ago, the Columbus Dispatch reported that Wendy's, the fast-food chain, announced "plans to install self-ordering kiosks in 1,000 of its stores — about 16 percent of its locations — by the end of the year." Although company officials observed 18 months ago that such a move would be inevitable if the trend towards laws demanding far-above-market minimum wages continued, both J.D. Malone's Dispatch story and the Associated Press's condensed version based on Malone's work do not mention minimum wages at all. Most other establishment press news outlets are also failing to make any kind of connection between the automation Wendy's is employing and certain states' and localities' insistence that workers get paid far more than their labor is worth. Last year, the kiosks were coming. It didn't take them long to get here. ... The Dublin-based burger giant started offering kiosks last year, and demand for the technology has been high from both customers and franchise owners. Trimm said the kiosks accomplish two purposes: They give younger customers an ordering experience that they prefer, and they reduce labor costs. ... (Wendy's chief operating officer Bob) Wright noted that over the past two years, Wendy's has figured out how to eliminate 31 hours of labor per week from its restaurants and is now working to use technology, such as kiosks, to increase efficiency. ... One of the reasons Wendy's is a step ahead of most of its fast-food brethren is because the technology is being developed in-house. Its new 90 Degrees lab on North High Street in the University District is staffed with developers and other technology-focused employees. The lab sports a full mock-up of a restaurant front end where developers can test and tweak ideas on the fly. The New York Times has not done its own writeup on Wendy's announcement. Instead, it is carrying the AP report at its website, with no indication that it has ever appeared in the Old Gray Lady's print edition. USA Today also relied on the AP for its content in this matter, as have several affiliates, including the Detroit Free Press and the Cincinnati Enquirer. Even CBS News is relying on AP alone. Although there's no information directly available, it seems reasonable to believe — because the return on investment will happen more quickly — that the franchisees who are most enthusiastic about installing kiosks are the ones which are facing more immediate minimum-wage hikes in their respective states and cities. The press should know, and is failing to report, that Wendy's has been among the more outspoken companies warning that minimum-wage laws would lead to more automation. Although one could argue that the kiosks are eventually coming anyway, these laws are speeding up the process and are surely causing companies in the entire restaurant industry to look at the feasibility of automating other applications beyond the ordering function. We've had innumerable people who have never run a business in their lives trying to tell us that the effects of a minimum wage rise can only be glorious. So it's refreshing to hear the views of someone who will actually have to deal with the effects of a minimum wage rise: the CEO of Wendy's. Amazingly, they're not predicting that their newly better paid employees are going to spend so much more at their stores that their profit increases. Nor are they predicting that the rise in aggregate demand is going to do the same. Finally, they've not broken down in tears, agreed that the shareholders are just too greedy, and insisted that the capitalist pigs will just have to do without so that the workers get their fair share. No, instead they predict that that their restaurants will have to increase prices and reduce the amount of labor that they use. That is, make all consumers worse off and also make some people unemployed. This isn't the bright new dawn we were promised about a rise in the minimum wage, is it? It is what people like me have been predicting but remarkably few people seemed willing to listen to us. Last week the Wendy’s Company did a public service on its second-quarter earnings call by explaining how mandated wage hikes will lead to fewer jobs for the low-skill workers that progressives claim to be helping. They've not even passed a law yet to raise the minimum wage in general. Yet business is already planning how to deal with such a law if it is passed. That's how come we can get some of the effects of a minimum wage change in advance of the actual change. Because, amazingly, businesses do actually plan for the future. We are seeing exactly what Worstall and Wendy's management cited coming to fruition. Almost two years ago, if not longer, Wendy's was "planning how to deal with" laws that have since passed, and we are seeing "some of the effects of a minimum wage change in advance of" the effective dates of many of those laws. Anyone with an ounce of sense can see it, but the Columbus Dispatch, the Associated Press and those who have relied on their output won't report it. They appear to believe that they can wish the problem away by not recognizing it. Life doesn't work that way.